Growth and innovation go hand in hand. Without innovation, an individual or a society won’t advance and grow. In the business landscape, innovation plays a crucial role. It shapes entrepreneurs, leaders, companies, even the products, and services. It has the power to change lives, attract customers, and make an organization stay relevant. Innovation can be a major breakthrough, like a mind blowing new product or service. It can also be small yet incremental changes. Either way, it is a creative process. It’s a skill that you can hone with proper strategies and training. So on this week’s edition of Five Tips Tuesday, we gathered tips that can inspire and sharpen your innovative mind. Learn the importance of innovation on entrepreneurship. Check out Singapore’s latest program to support innovative companies. Get tips on how to manage the cash flow of your business. Find out the four innovation strategies the big companies are using. And last but not the least, get the book that can help you grow your revenue. Innovation is a survival skill. The economy changes fast, and without innovation, an organization will be left in the dust. But its importance goes way beyond survival. Read this blog to get in-depth insights about the importance of innovation in business. Singapore is one of the most desirable places for entrepreneurs to build their business. The country has various programs for startups and companies of all kind. This year, Singapore rolled out another project that will surely benefit entrepreneurs. The region created a S$1 billion fund to help innovative companies develop their business and expand overseas. Learn more about this awesome news here. A good cash flow is crucial in any business. As an entrepreneur, you need enough cash to pay your employees and suppliers. You’ll also need it for improving your services and products. A poor cash flow can stop your business from growing, or totally ruin it. Here are the three best tips for managing cash flow at any business. Growing your business is more challenging than ever due to global competition and a weaker economy. But companies like Apple, Amazon, and Starbucks overcame these challenges and managed to stay strong. How did they do it? They adopted at least four strategies. Find out what those strategies are here. Revenue growth requires solid strategies and proactive work. It sounds complicated and scary as well, due to the fact that hundreds of organizations fail because of lack of increase in revenue. But for Alex Goldfayn, CEO of the Evangelist Marketing Institute, revenue growth is quite simple. In his book ‘The Revenue Growth Habit: The Simple Art of Growing Your Business by 15% in 15 Minutes’, Alex shows fast and simple ways that will help your company grow. His clear and encouraging approach will definitely make you see marketing in a different light. 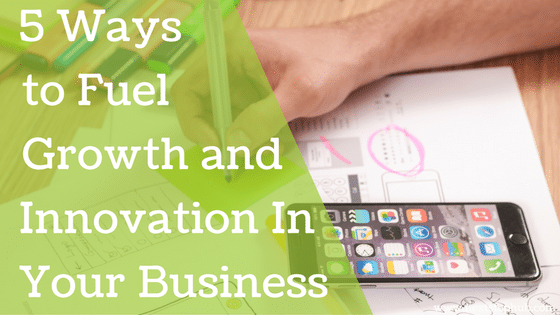 Do you have other tips that can help fuel an organization’s innovation and growth? Share it with us in the comments.